A former Subpostmaster writes: "I hate them." As this trial has progressed, I have received quite a bit of correspondence. 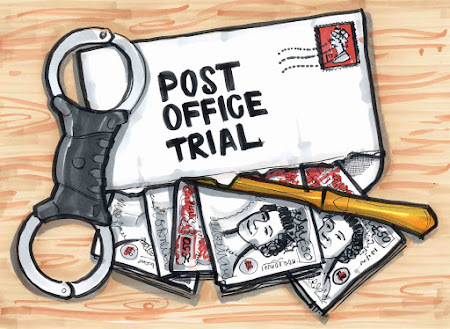 I have heard from Subpostmasters who are seriously worried about the outcome of this trial. They have viable Post Offices and they are worried that a win for the claimants would kill the value of their business. I have asked one of those Subposmasters to write a post on this blog. I too have been a victim of Horizon although mine was only (!) four figures. I was swooped upon by the auditors on a Thursday morning (pension day) in my little village post office early more than 15 years ago, and it was one of the worst times in my life. I had asked for help so so many times from the non helpline. One time trying to balance from 12.30pm until 10pm. I had my area manager come and shadow me on cash account day only for the discrepancy double before his eyes and he had no solution either. I took a breakdown of my phone bills to show at interview how much I had rung the helpline. I was suspended for 3 months. I went to a solicitor who told me the Post Office was the last bastion of the British Empire as we could not get any info from the PO to help me. I paid the money and was reinstated but never got over the dread of cash account day. paid any discrepancies on time and even now 18 years later (I’m a manager of a charity shop), I am anxious when cashing the till up. It was such a relief when I sold up but I’m sorry to say the new lady had the same problems after I had gone with the debt doubling at rollover. She has become a friend, and to my shame, I’ve never told her of my suspension or my Horizon problems as until the Second Sight programme (2013?) I thought I was useless with the system. I want the Post Office held to account. I hate them. I hate how they made me feel and I’m by no means as badly off as a lot of people. I know you’re a very busy man and I don’t expect a reply, I just needed to offload. I’m in tears just re-living this." I'd like to thank my anonymous correspondent for getting in touch and telling her story. It is heartbreaking. But it also has a twist. How many former Subpostmasters have kept quiet about discrepancy problems at their Post Office, in order to sell them on and get out? Do the Post Office tell incoming Subpostmasters about previous balancing problems at a branch? Maybe not, because the Post Office position tends to be the faults are the faults of the Subpostmaster, so by that logic, the Subpostmaster leaves and the fault clears up. What if the fault is down to an existing member of staff in the branch (eg as yet undetected theft or mis-keying)? Can the incoming Subpostmaster be obliged to take all existing branch staff on under TUPE rules? Or can the new Subpostmaster sack the existing staff all and install a new regime without breaking employment law? If a working Subpostmaster or someone from the Post Office wants to write a response - anonymously if you would prefer - I'd like to hear it. Even if it is something along the lines of: "you were making mistakes, so tough cheese". I was getting a little frustrated with the lack of progress on my repeated requests for court transcripts during this trial. I had been assured that both the claimants and defendants had agreed in principle I should receive them, but I still wasn't getting them. In court I could either bosh out blow-by-blow live tweets of proceedings (as parahphrases and notes), or stay alert for a newsworthy couple of quotes/exchanges and make sure I had them 100% accurate before sending them on to contacts in the media for possible publication. I didn't feel able to do both. I went down the live tweets route, but it made for a very difficult daily post-proceedings write-up - by not being able to supply verbatim quotes to newspaper and broadcast colleagues I was limiting the effect of my reporting. On Friday I wrote to the judge and circulated a letter to the claimants and defence teams. It is an application to make an unofficial sound recording of proceedings, which you can read here. I wasn't expecting much. When I sent the letter to the judge's clerk via email on the Friday I got her out of office reply, which said she wasn't back until Tuesday. I realised I was going to have to get the letter to the judge by hand on Monday morning before court started. I wrote a cover note and printed it out, along with several copies of the letter, in case the email I sent on Friday hadn't reached the claimants or the defence. I arrived early at the Rolls Building and made sure the claimants and defence team were given hard copies. Thankfully, as I did so, both parties confirmed they had already seen it. I went into court 26 about an hour before proceedings were due to begin and waited for an usher to arrive. A brisk gentleman soon appeared and started putting out jugs of water around the court. I asked if he would be kind enough to hand my letter and covering note to the judge. He viewed it with suspicion. The usher said he was prepared to hand it to the judge at the beginning of proceedings, but not before. I told him both parties in the trial had confirmed to me they had sight of my letter already. He stood his ground. Then he asked me which trial I was covering. "Bates v Post Office" I said. "This isn't the court for Bates v Post Office" he said. "Really? But it's been the court for the last two weeks." The usher eyeballed me. "This is a private hearing..."
Then he looked at my note. "Who is the judge?" he asked. "Mr Justice Fraser." I said. He looked again at my note again. "Oh s***!" he started. "I'm in the wrong court! Tell the next usher the water is fresh!" he said racing. "Will do." I said, cheerily. The transcribers came in. They were nice but not chatty. Eventually another usher came in and said something to the transcribers about the water. This was my in. "Hello!" I said. "I'm a journalist. The last usher who came in told me to tell you that the water in the juges is fresh. He got the wrong court." The new usher narrowed his eyes. "Anyway" I said, flourishing my letter, I would be most grateful if you could give this to the judge." The new usher told me he would hand it to the judge when the judge was about to walk into the court. I explained that I was not big on springing things on judges, and that I'd be really grateful if he could give it to the judge in chambers, rather than just as he was about to start cracking on with quite an important trial. I also told him both the claimants and the defence had already seen the letter. I explained I had tried to get my letter to his lordship on Friday but his clerk was away. I hinted the other usher, before he ran out of court, indicated that taking my letter to the judge's chambers might be feasible. The clerk gave me the once over. "I could give it to him when he comes down. How long is it?" "Okay" he said. "I'll give it to him when he comes down." And he did. Read the letter and then have a look at the transcript of what happened next (below). As I said to his lordship at the time - I am very grateful. MR CAVENDER: My Lord, I have a copy of the letter, yes. today I think I ought to deal with it first. for any observations and then I'll decide what to do. MR WALLIS: I would like to, yes, if I may. of what is happening to get a gist of what is going on. direct quotes unless I have heard them perfectly. a position to do both. any quotes you use are accurate, is that a fair summary? basically record it yourself, is that right? finalised usually by about 5.30 in the evening. transcripts and haven't received any so far. MR JUSTICE FRASER: I didn't know that. defendant and approved to Opus. to be finalised, is that right? MR JUSTICE FRASER: Is today Day 11 of this trial? hasn't been able to see those. transcripts. It is a process and timing point. MR GREEN: My Lord, indeed. different things of what has happened. MR JUSTICE FRASER: Mr Cavender. MR JUSTICE FRASER: This is the recording point? obviously while he is tweeting things are happening. And I understand the point about accuracy of quotations. in the courtroom, potentially privileged conversations. which I am usually getting about 5.30/6 o'clock. isn't it, because that risk is there anyway? MR JUSTICE FRASER: All right. MR CAVENDER: I am not making any massive point. accurate way of describing it. that be sent to you then. MR WALLIS: I am very grateful, my Lord. needs to be sent to him. the purpose of the press. MR WALLIS: I am very grateful, my Lord. Thank you. MR JUSTICE FRASER: Does that make sense? Right. will get on with the last three witnesses. "I balanced and it showed a loss of £32,000"